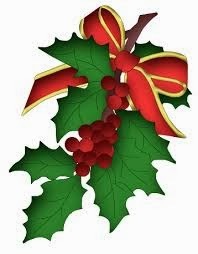 The following is an abridged translation of a story from G. Lenotre's Légendes de Noël, a series of Christmas tales set in the Revolution and Empire, first published in 1910. Lenotre (Louis Léon Théodore Gosselin) was a great historian and unusual for his time in his willingness to extend sympathies to both sides of the Revolutionary struggle. In this story, he finds humanity in one of the most hated figures of the Terror, the Public Prosecutor Antoine-Quentin Fouquier-Tinville. I have been unable to trace the comte de Courville, but Lenotre's view of Fouquier-Tinville is certainly based on details fully documented elsewhere in his work. 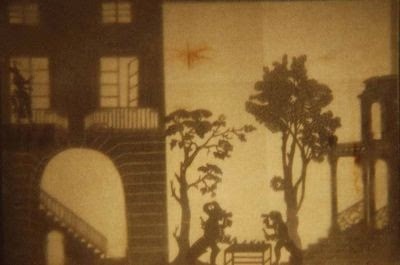 Accurate too is the description of Séraphin's famous silhouette theatre which operated in the Palais-Royal, to patriotic enthusiasm, throughout the darkest days of the Revolution. In the time of the Terror, a passerby at night who walked along the quai de l’Horloge, under the walls of the Palais de Justice, would quicken his step and, take care, out of instinct, not to raise his head. 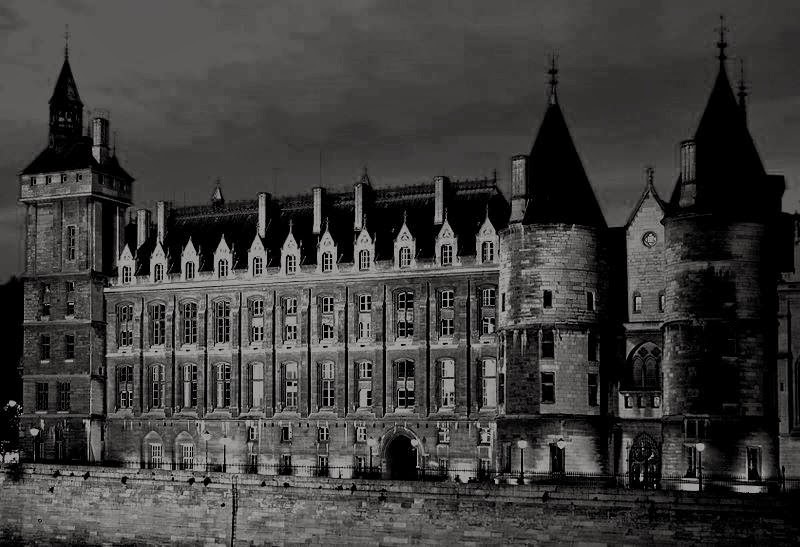 In one of the windows next to the towers of the Conciergerie, a light burned from dawn to dusk which, as far as it could be seen, made the people of Paris tremble in fear. This light illuminated the cell where worked, day and night, Antoine-Quentin Fouquier-Tinville, the Public Prosecutor, the feared magistrate who furnished the Revolutionary Tribunal with its required quota of accused and the guillotine with its daily harvest of heads. The life of this man, whose tragic name weighed over Paris like the legendary sword over the head of Damocles, was one of crushing labour. He slept three or four hours a day, rarely more. For twenty hours at a stretch, he prepared the work of the death-machine, a colossal task which he would entrust to no-one else. 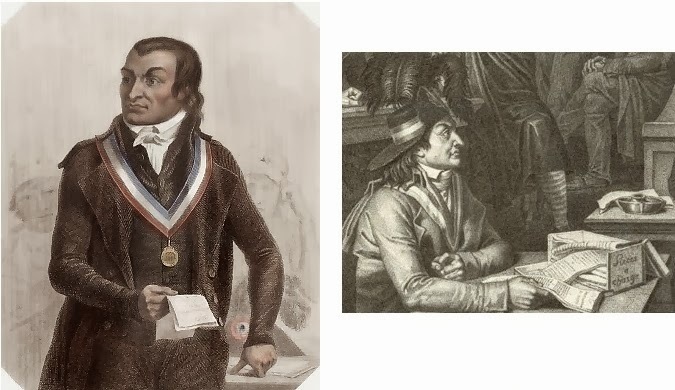 After the Revolution, the enormous bulk of the Tribunal’s dossiers were preserved in the National Archives, six hundred boxes stuffed with papers, inquiries, requisitions, depositions, seized documents, acts of accusation, reports, denunciations, interrogations...all had passed through Fouquier’s hands, every sheet with the sinister annotation of his red crayon and that terrible mark in the margin where he discerned a key question, the mark which indicated the trap into which many an unfortunate, his life in the balance, had stumbled. 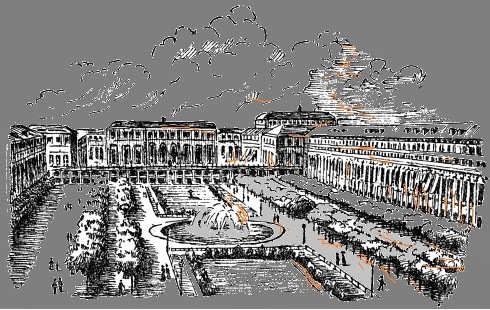 ....The Palais-Royal was an ever-bubbling cauldron into which spilled the immense city, those ardent for pleasure, thirsty for gain, or simply bystanders of other people’s happiness. 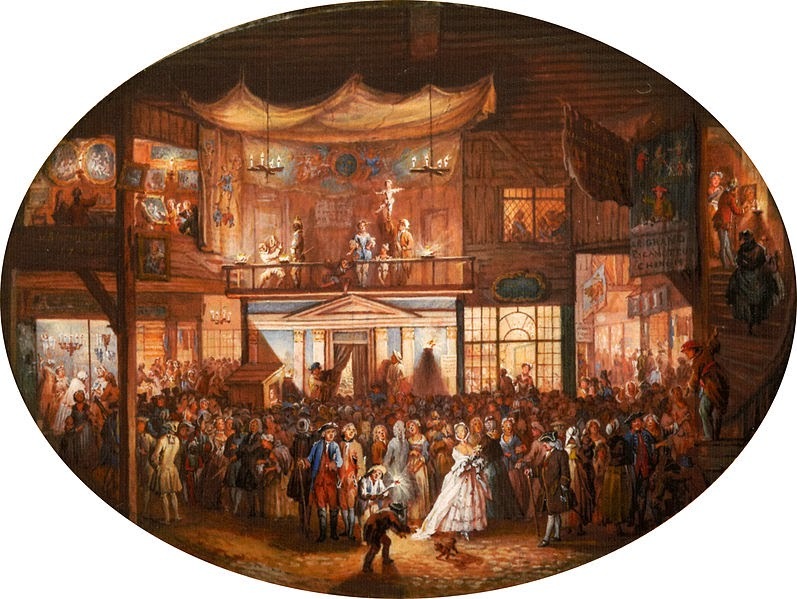 On Christmas eve 1793 Fouquier-Tinville entered this bright arena. His face was known only to spectators of the Revolutionary Tribunal. He had never been seen in a place of entertainment. What spectacle was there to please him? What public place could exist where the whisper of his name would not empty the crowd around him? What drama could he have gone to watch? Could there be any more terrifying than the one he acted out every day? So he walked, his hat down over his eyes, through the crowd, with an air of preoccupation and a nervous tic on his left cheek, as though weighed down by the terror and hatred of the whole world. What was he going to do? Perhaps, coming back from the Tuileries, where he went in the evening to take orders from the Committees, he had gone in, caught up by the irresistible attraction of movement and noise? A bird of the night, descending from his tower, he had been drawn in by the light and so he slipped among the glittering galleries, this man of death, astonished to mix with the living and to walk elbow to elbow with happiness. 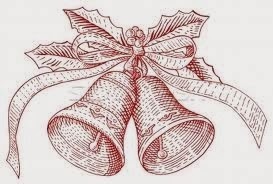 It was, as we have said, Christmas Eve; and although Midnight Mass and the reveillon were officially suppressed, a tradition so many centuries old demanded a feast; the spits turned, the puddings browned, faces were in festive mood, and the galleries were thronged with people determined to enjoy themselves and eat their fill. In one of the arcades, next to the famous Number 113, a crier was barking, “Roll up, roll up, young and old, to the Theatre of Citizen Séraphin! See the Chinese Shadow Theatre, living, moving, but immaterial. Tonight Citizen Séraphin will be showing, “The Broken Bridge” followed by the patriotic drama “Beauty and the Beast”. Come on in! They are starting; time to take your places….."
The crier made his way along the gallery, shouting his announcement. 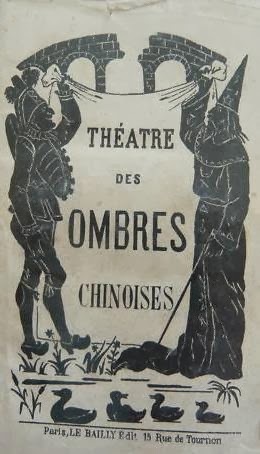 Under the narrow door of the little theatre, which was marked by a big square lantern decorated with silhouettes, children accompanied by parents, governesses and servants, crowded round the ticket office, craning their heads, their eyes alight with expectation. Then it was the famous scene, Séraphin’s triumph, “The Girl who let her tripes be eaten by the cat…” Everyone laughed; even Fouquier-Tinville himself laughed; only the two little girls did not laugh. Their sadness struck the Prosecutor and intrigued him. Not that he had been moved by tears in a long time, but the contrast between everyone’s joy and the misery of these children obsessed him. He leaned towards the governess and demanded harshly. - Are these little ones ill? - No, Citizen, she replied. - Why aren’t they laughing like all the others? - They have their troubles. - Something like that, Citizen, the woman replied. The two little girls turned timidly towards Fouquier and seemed to follow the dialogue between him and their companion. In the flickering light of a “firework” he discerned that their eyes were large with tears. He was going to press his questions further but saw such pain in the eyes of the two children, that he feared he had been recognised, he was afraid… He withdrew back onto his seat and said nothing more. ....The curtain rose on the final number in the programme, "Beauty and the Beast", which was billed as a "patriotic play". Still all in silhouette, there appeared: a Revolutionary Club, a patrol, an agent of the Committee of General Security, a jailer and an executioner. The interior of an aristocratic house was represented, the house of a former gentleman who had conspired traitorously against the Republic. The agent of the Committee went to denounce him to the Club, the patrol began to march and burst into the conspirator's house. He was arrested, despite the pleas of his wife and children; in the following scene he was seen in prison where the executioner entered, rope in hand, and tied him up to prepare him for the guillotine. At last it was the end of the little drama and Séraphin concluded his commentary with the following words: “The miserable are going to be punished for their crimes. And so perish, citizens, all the enemies of liberty. If this has pleased you, tell your friends and send them to see Séraphin’s Theatre.” Fouquier-Tinville had listened to the patriotic spiel distractedly, his attention absorbed, from the first, by the attitude of the two little girls whose melancholy had so intrigued him. - I beg your pardon, Citizen, said he, a question, please?. The woman recognised her neighbour from the Théâtre Séraphin. A well-used metaphor, but one current at the time, has credited Fouquier-Tinville with “the face of a tiger”. Either his physionomy was not so terrible at that moment, or he knew how to modify it to fit the circumstances, for the governness read such interest and tenderness in his face that she didn’t hesitate to stop. - I noticed, continued Fouquier, the distress of these little ones. I wanted to know the cause. Perhaps….he added, lowering his voice and looking around him nervously, perhaps it might not be without use if I were to know…. - Yes, Citizen, .Alas, she continued more quietly, we fear that in a week’s time he will appear before the Tribunal. - You can understand, seeing the same scene acted out which devastated our house yesterday in all reality, these poor children thought of their father…. The woman hesitated; she feared she had already said too much; but as though moved by a sudden inspiration, by a foolish hope that clutches at straws, the younger of the two girls looked up at the man she thought could be her protector, her eyes filled with tears, and she said, shaking with sobs: “Monsieur….if you could ….do something to get us back our papa…. He is called the comte de Courville”. And opening her little arms, she threw herself at Fouquier-Tinville who had bent down to hear her words. He hugged her convulsively against his chest, then, pushing her away brutally, strode away quickly and was lost in the crowd, under the galleries. The next day a sealed letter was delivered to the former Hôtel de Courville on which was written “To Félicité et Laure Courville. For Christmas”. And underneath these two lines, as a signature, a simple first name: Quentin. It was an order to free the suspect, who, that same evening, was restored to his loved ones and was not troubled further during the Terror. We are assured that this anecdote is authentic; and, if the details are made up, the tradition survives that a movement of pity on a certain day, when faced with a child in tears, softened the heart of Fouquier-Tinville. And one cannot help imagining that, eighteen months later, when his turn came to mount the scaffold, when he crossed Paris to triumphant cries of hatred and anger, the worst storm of vengeful abuse which has ever buffeted a human being, one cannot help imagining that there were two children who cried at the thought they were going to put to death the man who had saved the life of their father. Who can say whether the tears of these two girls might not outweigh in the eternal balance the opprobrium and maledictions of the whole world? !